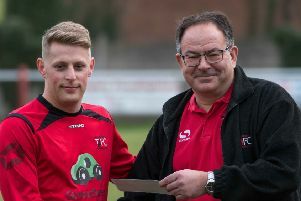 The Tring lads showed character from last week’s disappointment by earning a tight 1-0 win over Bedrove Dynamos in the Wycombe and South Bucks Minor League semi-final of the League Cup. The Tornadoes battled against a formidable opponent in a scrappy clash. But a single Tring goal in the tenth minute was enough to earn the close win when Lewis Whicker whipped in an awesome free-kick for Frankie Gray to head home. Tring will play Ruislip Rangers in the final in May.